With our lovely Tangthai expecting to have her baby in the first few months of 2018, we are all thinking about what a good mother we expect her to be. We thought you might like to hear a special story about another remarkable elephant mother. The story is in a fascinating book called ‘Elephant Bill’ (the nickname of the author, Lt-Col J.H. 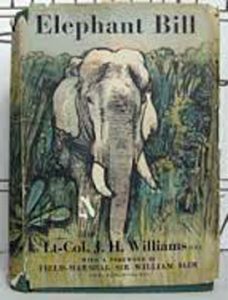 Williams) that tells the story of a Englishman who lived in the Burma jungle from 1920 for 25 years, working with elephants and their mahouts. He modernised old training and breeding methods and his love of elephants shines through. The book is full of amazing stories demonstrating the intelligence of these magnificent animals. He tells us about one elephant called Ma Shwe, who, with her 3-month old calf, became trapped in a flooded river with the water rising fast against steep, rocky banks. The calf, who was out of his depth, was screaming in terror and Ma Shwe fought desperately to protect him from the swirling water pulling him against her body with her trunk. 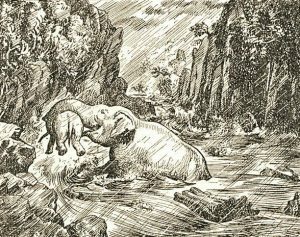 Suddenly there was a torrent that swept the calf away and Ma Shwe immediately plunged into the swirling waters, finally managing to catch the calf and pin it to the rocky bank using her head and trunk. The mahouts and Elephant Bill could only watch and pray. With a gigantic effort Ma Shwe then picked the calf up in her trunk, reared up until she was half standing on her hind legs and somehow miraculously placed him on a narrow shelf of rock five feet about the flood level. She then fell back into the river and was swept away towards a fearful gorge. But she knew there was one spot on the opposite bank to her calf where she could escape. It is a heart-stopping account and Elephant Bill writes of the wonderful sound of Ma Shwe’s defiant roar as she got out at that one possible place and was racing upstream along the bank opposite her calf. When she saw he was still there and was safe, the roar turned to a relieved loud rumble of pleasure. He described it as ‘…the grandest sound of a mother’s love I can remember’. Soon they were reunited, and the mahouts named the calf Ma Yay Lee (Laughing Water). 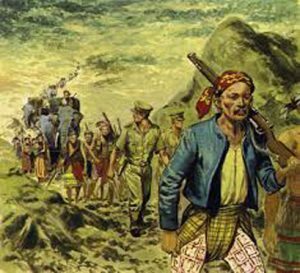 Later in the book, he describes how in World War II, the invading Japanese army planned to confiscate the Burmese elephants to make the bridges and railways they needed for their invasion. 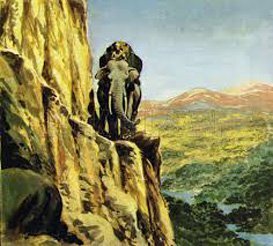 When he learned of these plans, Elephant Bill evacuated 45 elephants, together with their mahouts, wives and children, across the high mountains into the safety of India against amazing odds. A book like this comes along once in a lifetime and you will never forget the images it conjures up. © 2019 - Phang Nga Elephant Park. All rights reserved.